Wade Silzer, along with his wife, Paula, are the owners of the Captain's Corner and Rebel Marine. Both operations cater to servicing, restoring and storage of watercraft, ranging from towboats to cruisers. 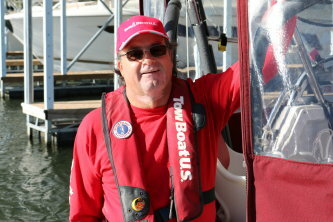 Silzer's parents had him on the water of Grand Lake at the tender age of three weeks and his first job in the business was that of dock boy at Port Tyler, now known as Cedar Port marina, in 1973. As with many businesses on Grand Lake, the idea for bringing a tow boat operation to Grand Lake was born during a casual conversation as the two business operators watched a boat being towed in to a local marina. That unlikely conversation got the ball rolling. After a trip to Lake of the Ozarks for a first-hand look at the TowBoatU.S. operation there, and visiting with area marinas and the Grand River Dam Authority, the decision was reached to bring a similar operation to Grand Lake. There were obstacles like permits, adequate insurance, equipping two boats to the specifications of BoatU.S. and some legal and contractual hurdles, but the operation is now good-to-go for the boating season on Grand Lake.